3. There absolutely must be a shop in walking distance (for the odd pint of milk or the frequent occasions when I am half way through cooking and realise I do not have all the ingredients I require!!). Luckily, the house we fell in love with is in a village that meets all three of those requirements! We are fortunate to have, not just any shop, but a decent Co-Op less than five minutes walk from our front door which stocks a really good range of fresh fruit and vegetables, store cupboard staples, chilled and frozen goods, tempting bakery delicacies and, most importantly, a well thought out and generous alcohol section (have I mentioned I like wine?!). 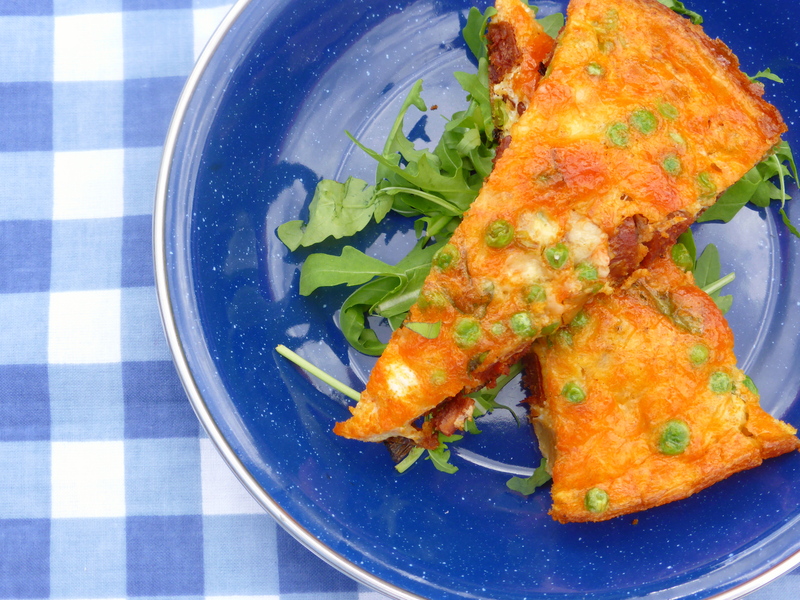 As regular readers of my blog will know I am a big fan of quick and easy meals that are packed full of flavour so when the Co-Op contacted me asking for my favourite ‘dinner in a hurry’, I couldn’t resist sharing my recipe for chorizo, pea and cheddar frittata. All ingredients are available from your local Co-op store. 1. Boil the new potatoes in slightly salted water for approximately 20 minutes, or until soft. 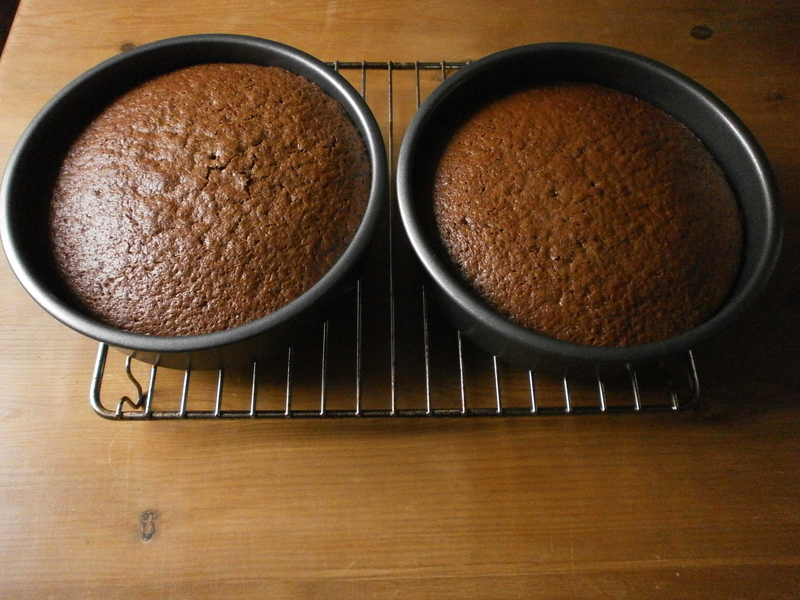 Drain and set aside, allowing them to cool. 2. Slice the spring onions, peel and dice the chorizo. 3. Heat a large frying pan. Once hot, add the chorizo and spring onions and cook for approximately 5 minutes over a medium heat. 4. Meanwhile, in a heatproof bowl, pour boiling water over the peas. Cover and leave for 1 minute before draining. 5. Grate the cheddar and slice the, now cooled, potatoes. In a jug, beat the eggs along with a generous amount of salt and pepper. 6. Layer the potatoes over the chorizo and onion mixture in the hot frying pan, then scatter over half of the peas. Pour over the beaten eggs, top with the remaining peas, cheese and some freshly torn basil. 7. Cook the frittata on a medium heat for 10 minutes. Transfer to a hot grill until cooked through and the eggs have fully set, about 5 minutes. 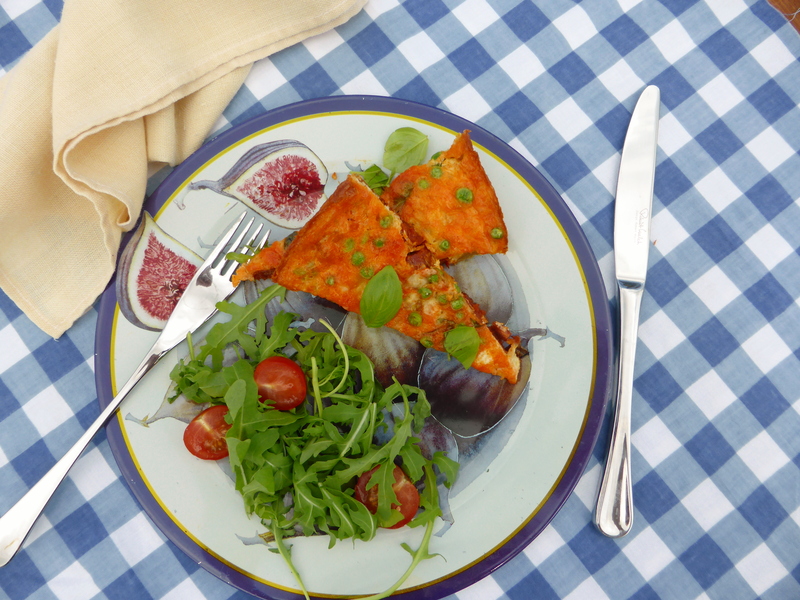 This recipe makes a super speedy, but delicious, summer meal and works particularly well served with fresh rocket and tomatoes, which compliment the strong chorizo flavour. The flavours of this dish evoke memories of hot summers spent abroad in the sunshine, whilst enjoying fresh, flavoursome meals from local restaurants due to the oily, smokey, goodness of the chorizo and the Italian influenced recipe however, there is certainly a British influence to due to the presence of the sweet peas, crunchy salad onions and mature Somerset cheddar. This recipe is the perfect fusion of my favourite ingredients from both home and away. What I love about this dish is I can whip it up in no time at all, including purchasing the ingredients from my local Co-op, and it will last in the fridge for days! Perfect for mid-week meals, during hazy summer weeks, when you would rather spend your time lazing in the garden, dreaming of past holidays and catching up with friends than slaving away over a hot stove. I try to love stir frys however, I am often disappointed with this type of cuisine and find that my dishes do not work out to be half as tasty as I had of hoped and no-where like the delicious meals that I have eaten at restaurants! That being said, I always persevere as I cannot help but adore the speed, ease and deliciousness of this type of dish not to mention the health benefits! Although I attempt to put together my own stir fry sauces, they are often quite thin and the taste of soy sauce is overpowering so, I instead resort to using ready-made packets of stir fry sauce. Readers of this blog will be aware that I am not a fan of processed food and hate buying sachets or jars of ready-made sauce; they are often full of preservatives and oil, not to mention expensive, and are really not that good for you which kind of defeats the point of eating a stir fry in the first place! Last night, for a quick and cheap Saturday night dinner, I made Jamie Oliver’s ‘Sticky Chicken Chinese Noodles’ last night from his cookbook ‘Save with Jamie’. Neil bought me this cookbook for my birthday last year and I love it – I do not think we have had a disappointing meal from it yet! 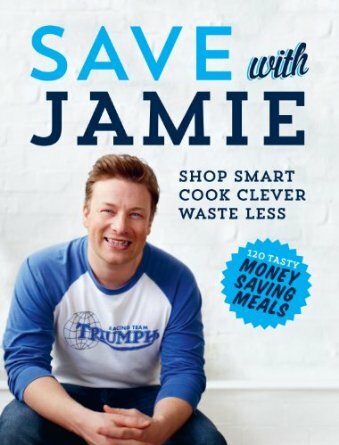 I have always been a fan of Jamie Oliver’s fuss free recipes which are packed full of strong, fresh flavours and this book emphasises that you do not need a big budget to cook delicious, inventive, waste free meals! I love the fact that ‘Save with Jamie’ emphasises the idea of using leftovers from your typical Sunday roast in order to ensure that nothing is chucked in the bin and really agree with this ethos (for my own tips, check out my series on making one roast turkey last for four days worth of lunches and dinners!). Due to this, I had high hopes for the noodle dish and was keeping my fingers crossed that my luck with stir fry dishes would change! 1. Toss the chicken with half of the five spice powder and seasoning, ensuring every piece is well coated. Leave to rest for a minimum of 5 minutes to let the flavours develop. 2. Pre-heat the oven to 180 degrees. Spray a wok with Frylight and heat. Crush the garlic, peel and finely slice the onion and carrot. De-seed and finely slice the chillies and chop the cabbage. 3. Cook the chicken for 10 – 12 minutes, turning frequently and drizzling with the honey for the last minute. Remove to a plate and put in the oven to keep warm. 4. Chop the pineapple into small pieces. Place them into a bowl with their juice, the soy sauce, vinegar and cornflour and mix together. 5. Boil a pan of salted water and cook the noodles for 5 minutes. Drain, reserving a little bit of the cooking water. 6. Rinse the beans then add them to the wok with the remaining five spice for about 5 minutes until crispy. Transfer to the oven to keep warm. 7. Cook the garlic, chilli and vegetables for a few minutes before adding the pineapple, sauce, noodles and a bit of cooking water. Mix well to ensure everything is well coated then season and add soy sauce if needed. Add the chicken and black beans back to the pan. 8. Before serving, scatter over some coriander and extra sliced chilli. This dish was totally yummy! Both Neil and I agreed this was, by far, the best noodle dish we have ever made. Although the pineapple brings some sweetness, it is not overpowering and the addition of the five spice and soy sauce makes this a well-balanced dish. 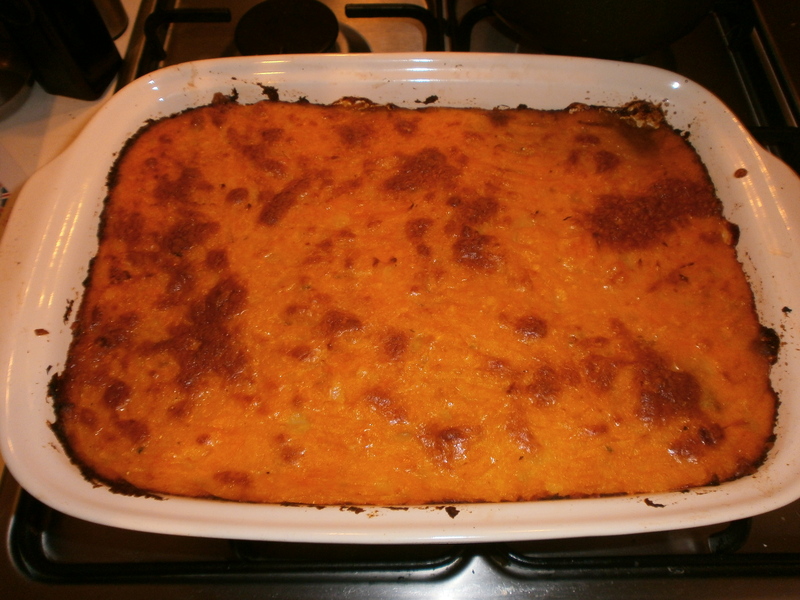 The cornflour ensures that the sauce isn’t too runny and it nicely coats all of the ingredients. The combination of the chillies and the five spice brings a little heat to the dish however, it is not too fiery and will not leave you gasping for water which is always a bonus! I love the addition of the crispy black beans which not only add a bit more protein to the dish, they also add crunch which ensure that the dish is well-rounded, not just with flavour but texture too! As the photographs demonstrate, I deviated from the recipe a little as per usual! I didn’t quite use all of the pineapple or juice and also, as I did not have any Chinese cabbage to hand, I used a bit of spinach and a green pepper instead. Due to my love of colourful dishes, I decided to use red onion rather than a white ones. Also, I used Fry light instead of Jamie’s beloved olive oil! 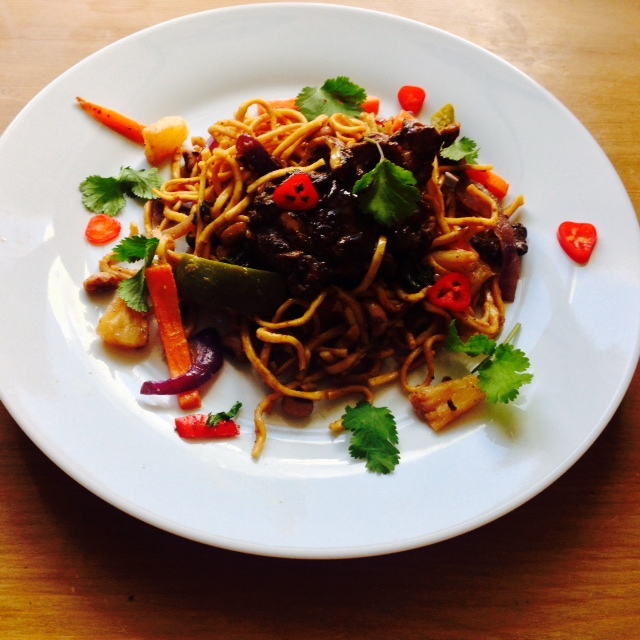 It appears that this recipe has got me out of my stir fry rut and is definitely a meal that I will be making again and again! Apologies it has taken me so long to post this recipe! 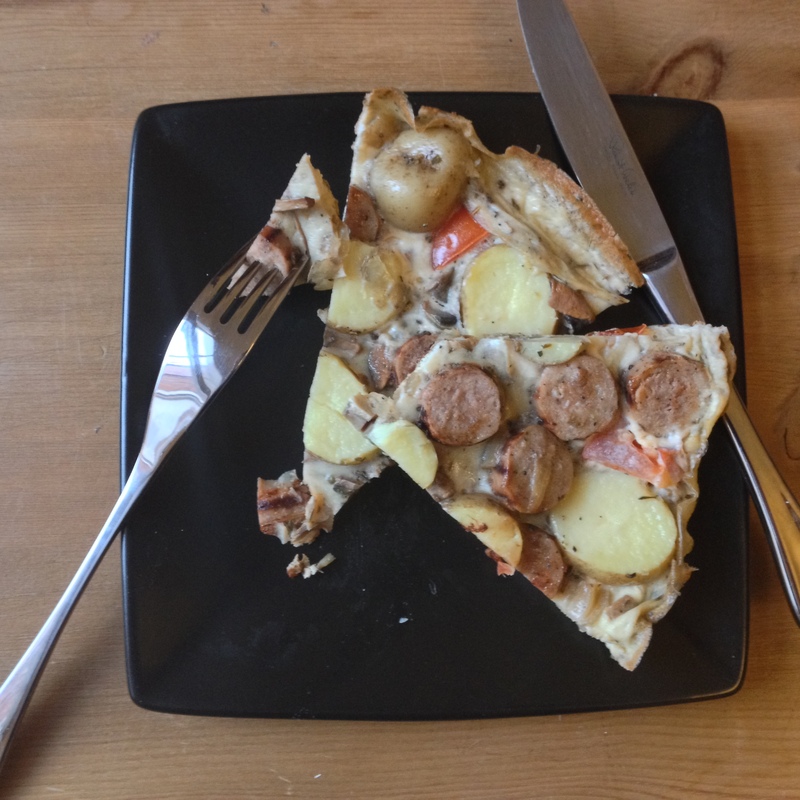 Last week, for ‘What I Are Wednesday’, I blogged about meals that can be made in advance, perfect for busy people who always seem to be in a hurry, and promised to post this recipe. I understand only too well how tough it can be to stay healthy and eat balanced meals when your life is hectic and you are running around like a blue-arsed fly; you simply do not have the energy to cook and look after yourself properly! It is always so tempting to simply grab a takeaway or some processed convenience food when you are in a rush but it really isn’t necessary. All it takes is a little organisation and you can easily eat healthily even when you do not have time to think, let alone cook a nutritious meal. When I am especially busy, I like to fill my freezer with pre-cooked meals that simply need a blast in the microwave and my fridge with dishes that will last for a few days and can be grabbed on the go. 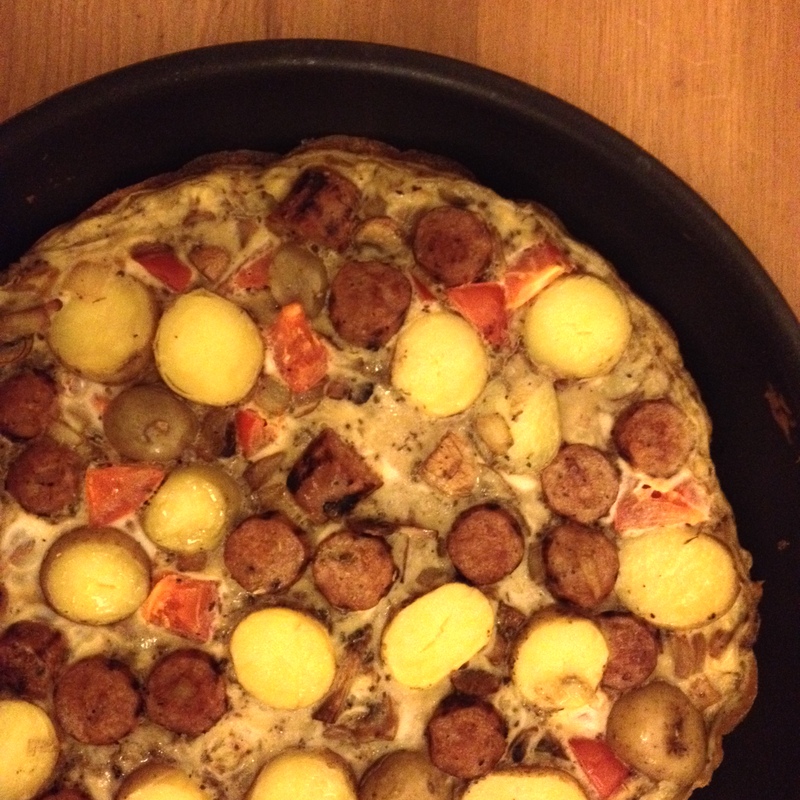 This breakfast frittata is a perfect example of this type of meal and is adapted from a recipe originally in a Slimming World magazine, so it is nice and healthy too! 1. Boil the potatoes for 20 minutes in slightly salted water. Once drained and cooled slightly, cut into slices. 2. Grill the sausages and, once cooked and cooled, slice each sausage into six pieces. 3. Spray a large frying pan with frylight and heat. Once the pan is hot, add the prepared onion and mushrooms to the pan and cook over a low heat for 5 – 10 minutes. 4. Add the sliced sausages and halved tomatoes and cook for another few minutes. 5. Beat the eggs with seasoning and the mixed herbs. Pour into the pan over the onion, mushroom, sausage and tomato mixture, coating the pan evenly. 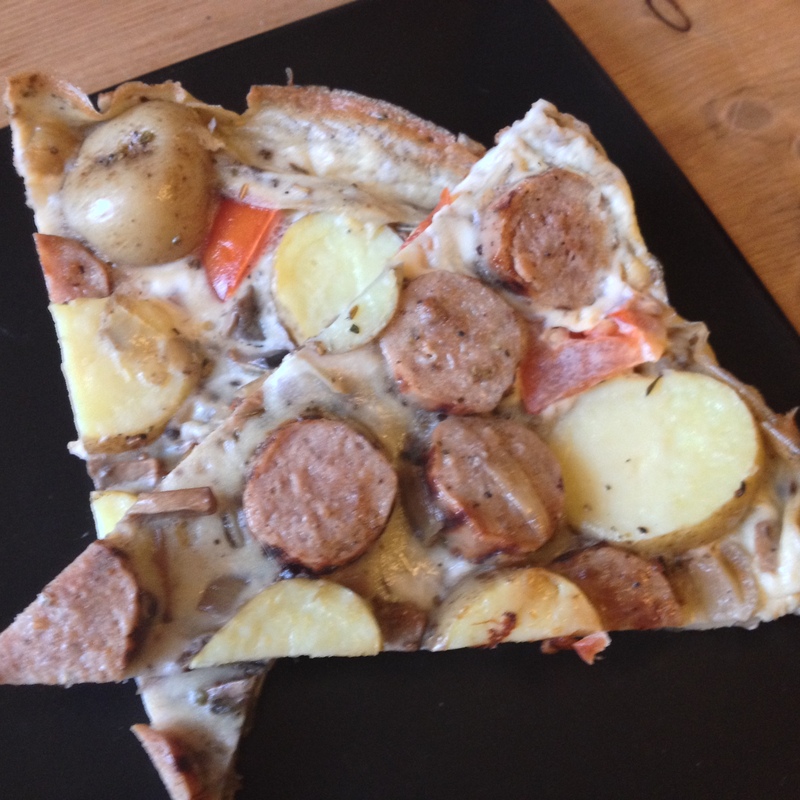 Top with the new potato slices. 5. Swirl the egg mixture around the pan and cook on the hob for 10 minutes. Transfer to a hot oven for another 10 minutes until cooked through. I tend to use Tesco’s Healthy Living sausages for this dish although vegetarian sausages work just as easily. Depending on how hungry my boyfriend and I are, I either cut this frittata into quarters or eights; if I cut it into eights we have a piece of fruit to accompany the frittata and it lasts twice as long! This healthy and filling breakfast will easily last for several days if it is wrapped up well in the fridge. I find it is an ideal grab-and-go breakfast that keeps me full up until lunchtime. I adore roasted vegetables. Something about the sticky sweetness of the red onions mixed with the burst of steam from cherry tomatoes, delicious herbs and mellow aubergine really appeals to me. They are so versatile too; I often use them as a side dish for grilled pesto salmon or mixed up with some spicy couscous – they even work with a Sunday roast! The great thing about roasted vegetables is that they taste great hot or cold so are often a go-to portable lunch in our household. Oh yeah, did I mention that they are really healthy too, an easy helping of your 5-a-day and packed full of anti-oxidants?! 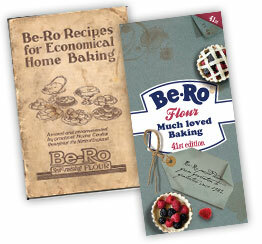 Bet you can’t wait for my recipe now….have I sold it to you?! 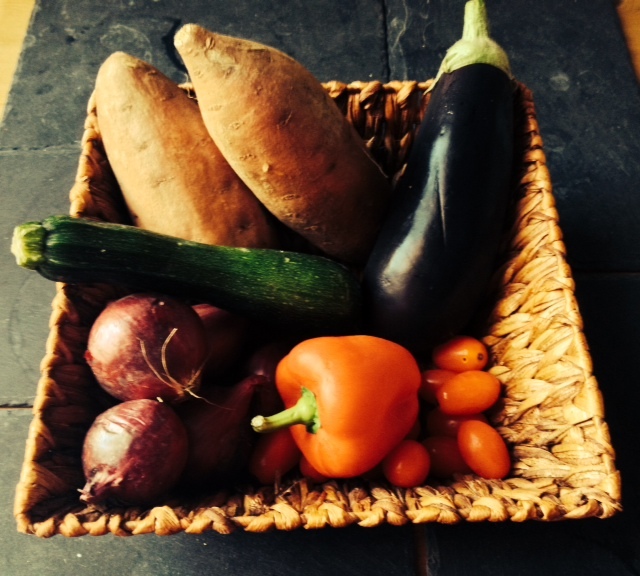 The winning combination I usually opt for is sweet potato, aubergine, red onions, courgette, peppers and cherry tomatoes. 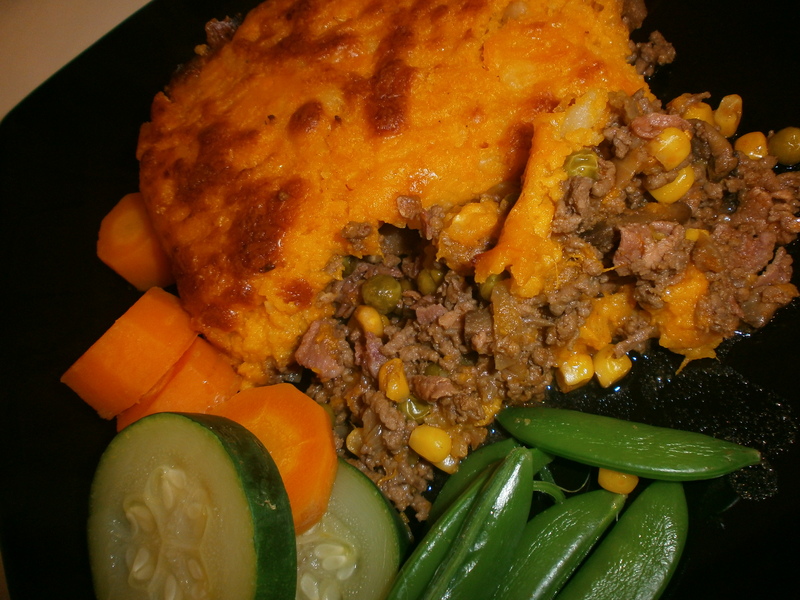 Of course butternut squash can be substituted for the sweet potatoes and various colours of peppers work well but I personally prefer red, yellow or orange – the sweeter the better! 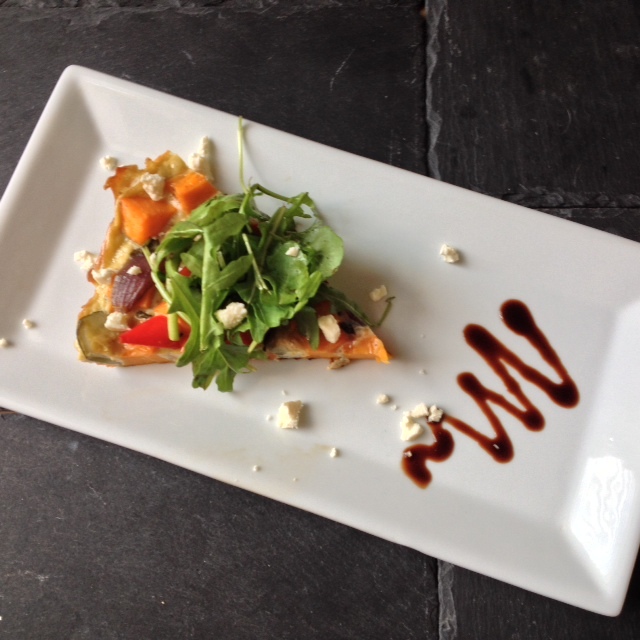 One of my absolute favourite dishes using roasted vegetables is my ‘Roasted Vegetable Frittata with Balsamic Leaves and Feta’ for a healthy light lunch or starter. Although this may seem like a very simple dish, the flavour combinations are a winner and it can easily be dressed up to impress for a party. Frittatas are basically the Italian version of an omelette. A good quality, non-stick frying pan is essential for the success of this dish. 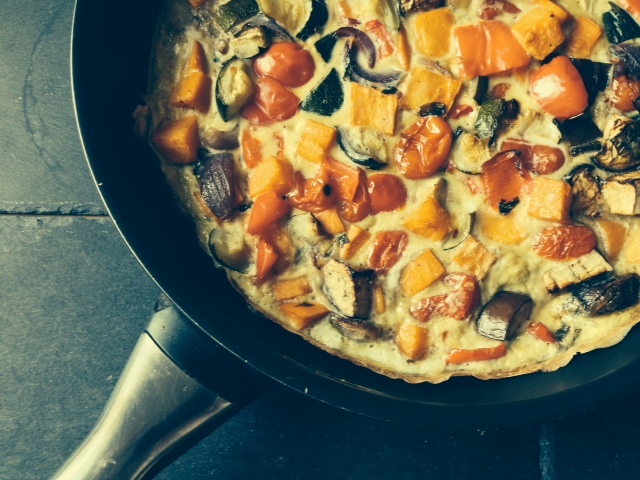 Don’t rush a frittata; the best results are seen with patient, slow cooking. 2. Dice the courgette, peppers, aubergine and sweet potatoes into 1cm cubes remembering to peel the sweet potato and de-seeding the peppers. 3. Remove the skin of the red onions and cut into 8ths. 4. Spray a roasting tray with fry light. Put the prepared vegetables in the tray along with the cherry tomatoes. Season and scatter over the basil, tearing it with your hands. 5. Roast the vegetables for 45 minutes, checking half way through and turning. Once the vegetables are done, remove from the oven and turn the oven up to 220 degrees. 6. Spray a large frying pan with frylight and heat. Whilst the pan is heating, beat 6 eggs in a measuring jug and season. 7. Pour the roasted vegetables into the pan and shake to distribute them evenly then pour in the beaten eggs and tilt the pan so that the eggs coat all the ingredients. 8. Cook gently for 5 minutes before transferring to the oven for 15 minutes. 9. 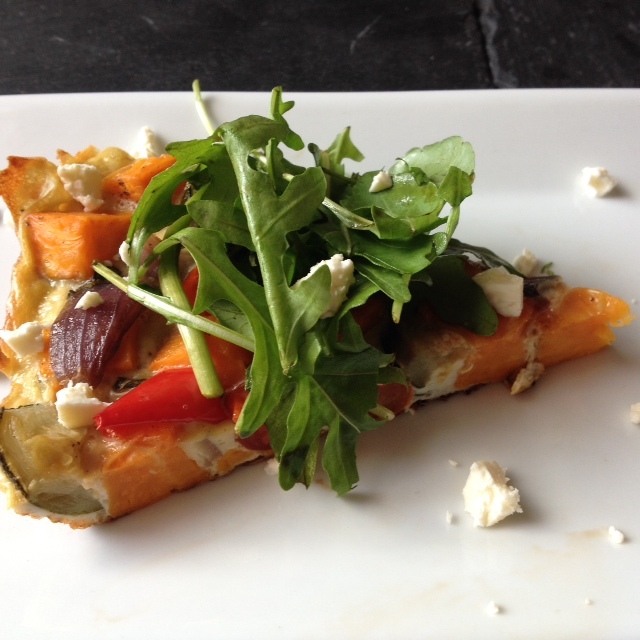 To serve, cut into 8 wedges, toss the lettuce in balsamic and place on top of the frittata, scattering over the feta. 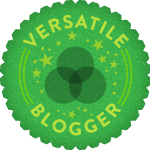 N.B – This recipe can be dairy free if you omit the feta. I adore this lunch and it is so good for you too! The saltiness of feta and the acidity of the balsamic leaves really contrast with the sweet sticky vegetables to provide a great all-round flavour. 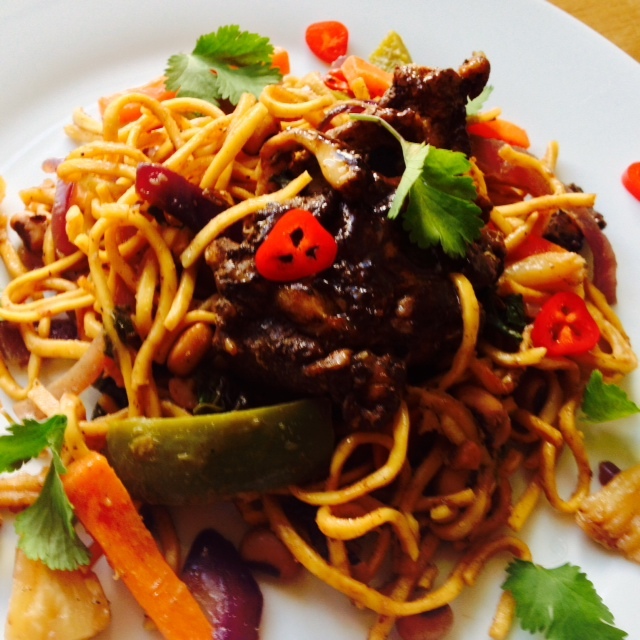 This dish is so quick to create, it really is a crowd pleaser – I hope you enjoy it too! I was utterly spoilt for my birthday this year and feel so thankful that I have such wonderful friends and family! One of my gorgeous gifts that I couldn’t wait to use was a set of teal Le Creuset ramekins from my lovely friend Lucy! I adore the Le Creuset range and always spend time admiring their casserole dishes when I visit my local cookery shop, Abraxas, however I think it will be some time before I can justify treating myself to one! On a cold Sunday afternoon a few weeks ago, it seemed like the ideal time to get in the kitchen and devise a warming dish to use my newly acquired ramekins. 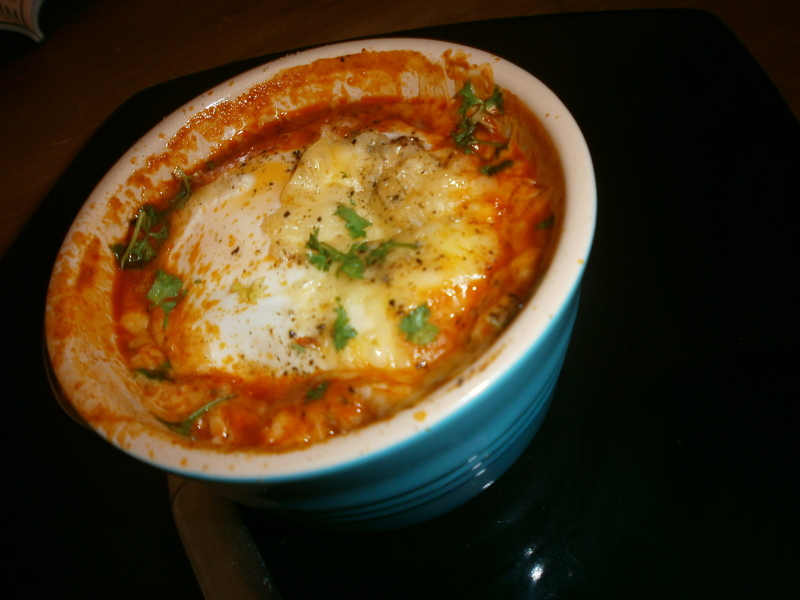 As both Neil and I love strong flavours with a bit of spice, I decided to put a Spanish twist on baked eggs. 2. Spray a small saucepan with frylight and heat. Once hot, add the garlic, closely followed by the spinach. Keep stirring whilst the spinach cooks to ensure the garlic doesn’t burn. Once the spinach has wilted and cooked, remove from the pan and set aside. 3. Return the pan to the heat, spraying it with a little more frylight. Add the chorizo and cook over a medium heat for a few minutes until the gorgeous spicy oils have been released. 4. Next, add the chopped tomatoes, red wine, smoked paprika and tomato puree. Season well and simmer for 5 minutes. 5. Take the pan off the heat and stir in the wilted spinach that was set aside earlier. Divide the mixture between two ramekins. 6. 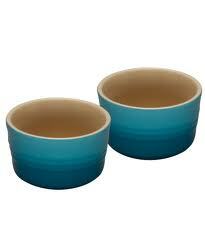 Crack an egg into each ramekin and top with a sprinkling of cheddar and some freshly milled black pepper. 7. Place the ramekins into a roasting tray and pour some room temperature water into the roasting tray until it reaches half way up the ramekins. 8. Bake in the preheated oven for 15 minutes until the eggs are cooked. Sprinkle over some parsley and serve with crusty bread for dipping. Unfortunately, the eggs in the photo are a little over done however, cooking in a ban marie as above will ensure they are cooked evenly. The eggs with a hint of spice, although slightly over cooked, were still the perfect light lunch on a cold autumn day and my lovely new ramekins were put to good use! Thank you Lucy! Happy Easter one and all!!! Whilst taking a walk around a rather empty town centre today, my boyfriend and I were talking about how Easter has become less of a religious holiday and more of a celebration of all things chocolate and an extra two days off work; we were actually quite surprised the majority of the shops remained closed (the pubs seemed rather full mind you!). 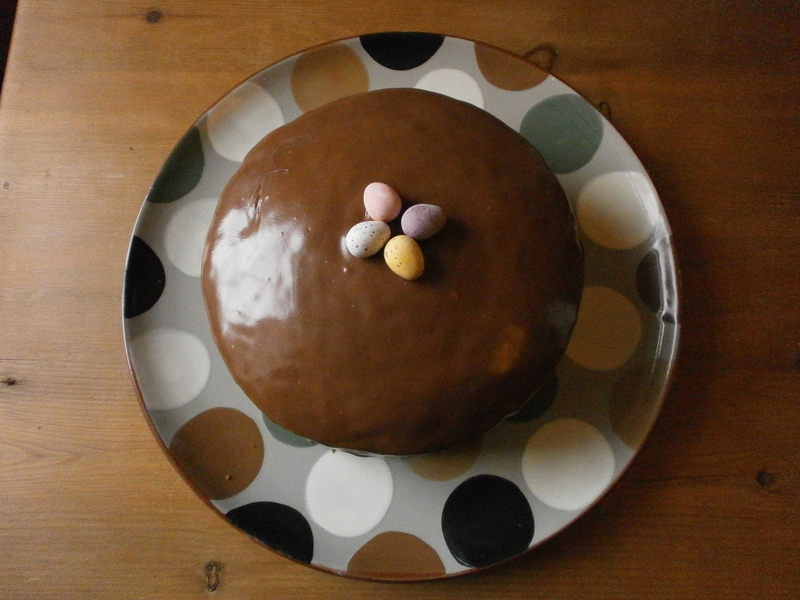 So, on to a few facts about Easter eggs…. Easter became associated with eggs as historically, it was tradition to use up all the eggs in the house before the beginning of Lent as eggs were forbidden during this period of fasting. The Spanish dish of hornazo is associated with the end of Lent as it contains hard-boiled eggs which were the surplus produced by chickens during the Lent period; in many Christian countries dishes featuring eggs are eaten at the end of Lent. 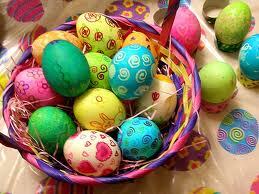 Easter eggs were originally dyed or painted chicken eggs; many were dyed red to symbolise the blood of Jesus Christ. Chocolate Easter eggs were first made in France and Germany in the early 19th century; most early eggs were solid until suitable moulds were devised to make hollow ones although the process of making hollow eggs was very slow as they had to be created one at a time. Cadbury’s first made Easter eggs in 1875, three years after John Cadbury made his first ‘French Eating Chocolate’. Put the chocolate, brandy and Stork in a bowl. In a small milk pan, heat the cream until almost boiling. Pour the cream into the bowl filled with the chocolate etc. Stir constantly until all the chocolate is melted and the mixture is lump free. 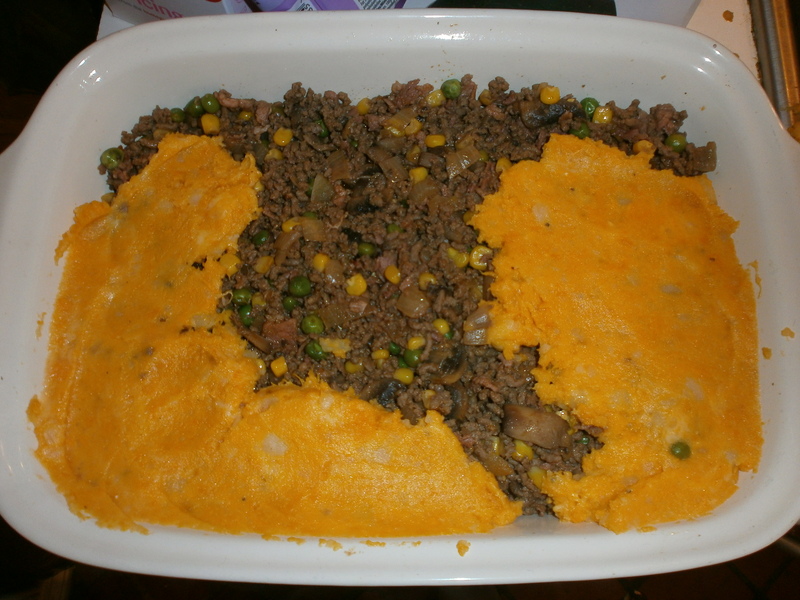 Pour into a small roasting tin/casserole dish and transfer to the fridge and allow the mixture to set overnight. Use a teaspoon to roll small amounts of the mixture into balls and then roll in the topping of your choice. Once rolled, pop the truffles in a dish lined with greaseproof paper and put in the fridge for a few hours to firm up. Recipe courtesy of Bridge 67 Cookery School. The above recipe is so simple and absolutely divine. The taste of the brandy is barely there but adds a certain sweetness to the mixture. And now for a second truffle recipe that I devised this weekend – I love peanut butter so just had to give peanut butter truffles a shot! Put the chocolate, whiskey, peanut butter and Stork in a bowl. Use a teaspoon to roll small amounts of the mixture into balls and then roll in the coco powder. Two truffle recipes, both absolutely delicious. 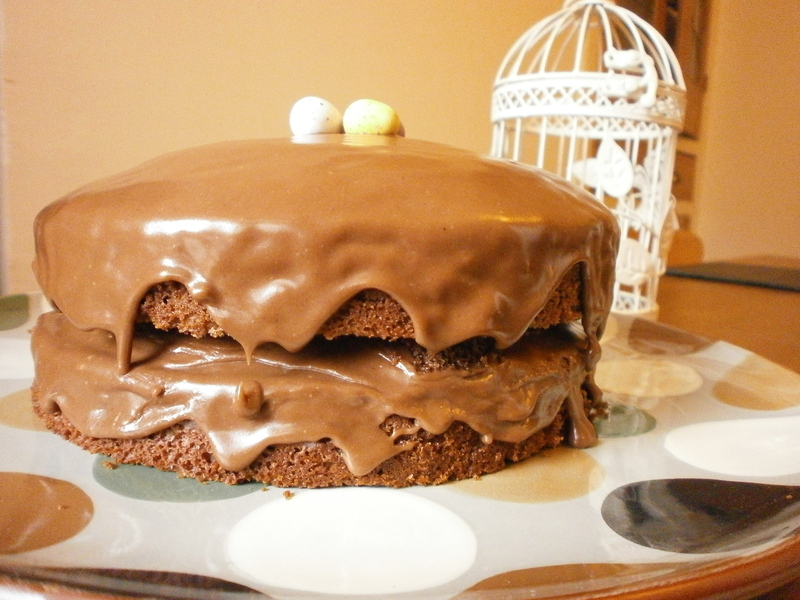 The ‘grown up’ alternative to Easter eggs although you certainly get very messy making them!